Curves studied by Fagnano in 1750, Euler in 1751, and Booth in 1877. James Booth (1810 -1878): British mathematician. Other names: Hippopede of Proclus, elliptic lemniscate (for the ovals) and hyperbolic lemniscate (for the lemniscates). with e = 1 for the ovals (take 0 < ), e = –1 for the lemniscates. Area: for the ovals, for the lemniscates. 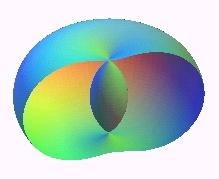 Booth's curves are the rational bicircular quartics possessing point symmetry. 1) They are the pedals of centred conics with respect to their centre (here, pedal with respect to O, of the conic ). - For an ellipse, Booth's curve is called Booth's oval; they are true ovals (i.e. convex) only for (and it is a circle for a = b); it is shaped like a bean in other cases. - For a hyperbola, it is called Booth's lemniscate because of its 8-like shape. We get a lemniscate of Bernoulli when the hyperbola is rectangular. From this we deduce that a lemniscate of Booth is the locus of the centre of a hyperbola rolling without sliding on an equal hyperbola, with coinciding vertices. 2) They are the envelopes of the circles whose diameters join the centre of a conic to any point on this conic. 3) They are the inverses of centred conics with respect to their centre (here, of the conic if ab is the radius of inversion - note the permutation of a and b with respect to 1) ). 4) They are the cissoidal curves of two circles (C) and (C') with respect to a point O such that O belongs to (C) and the centre of (C') is the point F on (C) diametrically opposed to O. The point F is any of the focal points of the conic from 1) ; here for example F , a being the radius of (C'). 5) They are the cissoidal curves of two coinciding circles with respect to any point. We get an oval or a lemniscate depending on whether the point in inside or outside the circle. We get the lemniscate of Bernoulli when the point is at distance times the radius of the circle. Here the circle is the circle of centre (middle of [OF]) and radius a/2. 6) They are examples of Watt's curves; they are the loci of the middle of a segment line of length 2d joining two circles of radius a the centres of which are at distance 2d. In other words, they are the loci of the middle of a side (of length 2d) of an articulated "rectangle", the other side (of length a) being fixed; we get lemniscates of the large side is fixed, and ovals in the other case. 7) They are Perseus' spiric curves (i.e. sections of a torus by a plane parallel to its axis) when the plane is tangent to the interior of the torus. This definition is the reason for the name hippopede of Proclus. More precisely, they are the sections of a torus of centre O, axis Oz, major and minor radiuses a and b, cut by the plane parallel to Oz and at distance d =|a – b| of O. 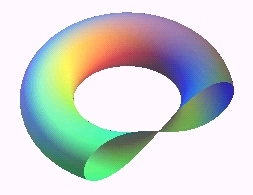 The curve is an oval when the torus is a spindle torus (b > a) and a lemniscate when it is a ring torus (a < b). In a frame with the projection of O on the plane as the origin, we get the Cartesian equation: . 8) They are the projections on xOy of the biquadratics who are intersections of the paraboloid of revolution and the second degree cone . 9) If we apply the scaling in one direction to the oval ,we get a curve with polar equation where and ; therefore Booth's ovals are, up to scaling in one direction, polygasteroids. Compare Booth's curves to Cassini's ovals. See also Fresnel's elasticity surface which is the generalisation to a 3D space of Booth's oval. See also Booth's lemniscate on the Roman surface.